Big chunks of chocolate in a cookie. The definition of a chunk is a thick or large piece of something. 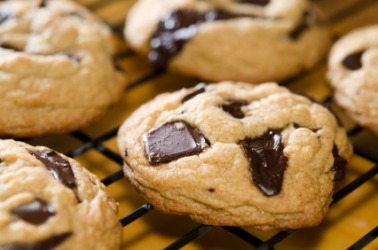 An example of a chunk is a large piece of chocolate in a cookie. "chunk." YourDictionary, n.d. Web. 20 April 2019. <https://www.yourdictionary.com/CHUNK>. A thick mass or piece: a chunk of ice. Informal A substantial amount: won quite a chunk of money. To make a dull clacking sound: listened to the rundown copier chunk along. A representative of a substance at large, often large and irregular. To break into large pieces or chunks. (slang, chiefly Southern US) To throw. Brady held up the chunk of steel. Mauch Chunk cluding the Bur- 4. Mauch Chunk is served by the Central of New Jersey railway and, at East Mauch Chunk, across the river, connected by electric railway, by the Lehigh Valley railway.